For this reason, in the biblical text, the humble and those who fear God are also called poor in spirit, that is, those who do not possess an inflated spirit. And the beatitude ought not to begin any other way, because it must arrive at achieving the highest wisdom. Precisely, the beginning of Wisdom is the fear of the Lord (Sir. 1:16), since, on the contrary, it is written that the beginning of all sin is pride (Sir. 10:15). Consequently, let the proud desire and love the kingdoms of the earth: Blessed are the poor in spirit, for theirs is the Kingdom of Heaven” (s. dom. mon. 1, 3). “The beatitude begins with humility: Happy are the poor in spirit, that is, those who are not bloated, when the soul submits to divine authority, because he fears to go into damnation after this life, even though, perhaps, he may seem happy in this life. Consequently he arrives at knowing the Sacred Scripture, where with the spirit of piety he learns meekness, so that he may not exceed as to condemn something that the worldly judges to be absurd and he may not become unruly sustaining obstinate quarrels” (s. dom. m. 1, 10). And who is poor but the body of Christ while a pilgrim on this earth. For this reason every believer who really wishes to be a member of Christ must be conscious of being poor on this earth: “I am a poor who suffers. They have brought me to misery, they placed me in this pain; that is why I say these things. It is not the anger that curses, but the prediction of a prophet. He wants to inculcate in us all that later he will say of his poverty and his sufferings that we may learn to be poor and to bear suffering. Blessed are the poor for theirs is the kingdom of heaven. And also: Blessed are those who weep, for they will be consoled. All this he has desired to show us in advance, and thus he said: I am a poor who suffers. He says this of the whole Body. The Body of Christ on this earth is poor and suffering. And even though there are rich Christians, if they are real Christians, they are poor; in comparison to the heavenly treasures they hope for, all the gold they consider as sand. I am a poor who suffers” (en. Ps. 68:2, 14). “Blessed are you poor, for yours is the kingdom of God” (Lk. 6:20). How do you live the poverty that the kingdom of God asks of you? What do these words of St. Augustine mean to you? “Blessed are the poor is spirit … Not the poor of riches, but in desires” (s. 53A, 2)? “Rejoice and leap for joy on that day, for your reward will be great in heaven” (Lk. 6:23). Why is there joy in living out the Beatitudes? What importance does the eternal reward in the kingdom of heaven have in your life? To what are you committed? 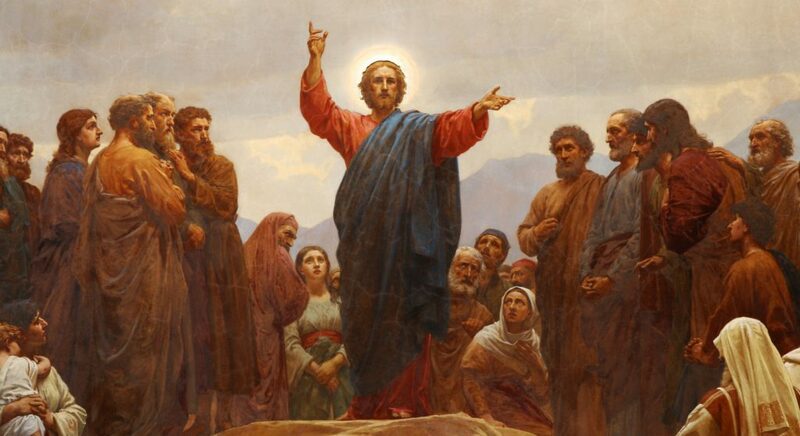 Contemplate Christ preaching the Sermon on the Beatitudes and the disciples around him. Contemplate the reactions of the disciples and the face of Jesus that offers peace and joy for a new way. Contemplate and adore. Contemplate your own heart and put it in the hands of Christ asking him to make you possess a true spirit of poverty; acknowledge your poverty and limitation, and contemplate that everything good that is in you comes from God. Be thankful and contemplate. Lord God, Father Almighty, with pure heart, as far as our littleness permits, allow us to give you our most devout and sincere thanks, begging with all our strength from your particular goodness, that by your power you may drive away the enemy from all our thoughts and actions; that you may increase our faith, govern our mind, give us spiritual thoughts, and bring us to your happiness, through your Son Jesus Christ, our Lord, who with you lives and reigns, in the unity of the Holy Spirit, God, forever and ever. Amen (en. Ps. 150:8). “Therefore, the poor who are blessed in his spirit are rich by the Spirit of God, because every man who pursues his own spirit is proud” (en. Ps. 141:4).